If you thought the market for single-use cameras was dead, think again. Lomography today launched its Simple Use Film Camera that comes in three variations: color negative film, black & white film or the Lomography-exclusive color-shifting film LomoChrome Purple. The cameras come with a built-in flash and Lomography says they are perfect for parties, road trips, weddings and similar occasions. Three different color gel flash filters let you tint your color or LomoChrome Purple shots and if you are feeling adventurous you can even try replacing the pre-loaded film when the roll is finished. Lomography says the camera is designed for single-use only and film replacement can be tricky, but still gives detailed replacement instructions on its website. The film sensitivity is ISO 400 for all three types and finished rolls can be developed in any lab. The camera is powered by an AA battery, and shutter speed and aperture are both fixed at 1/120s and F9 respectively. 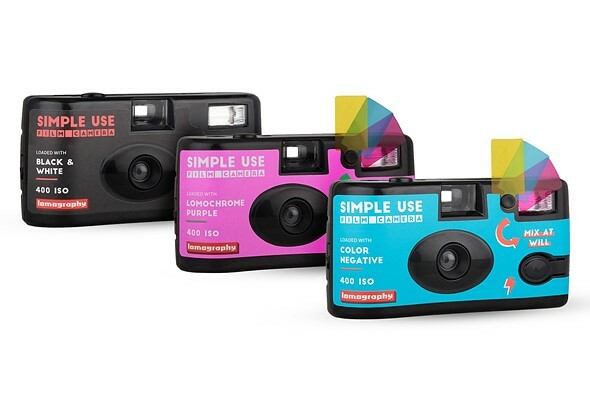 A three camera bundle is available to order on the Lomography website now for $52.92. You can also buy individually, in which case the color and black & white cameras will set you back $16.30 each, the LomoChrome Purple is $21.90.